Amy Schumer loves a good photobomb! The 36-year-old comedian pulled off the epic move in London on Thursday, hilariously crashing a couple's wedding photo shoot. As Jasmin Pereira and Jon Bates were posing for a photo, Schumer creeped up behind them, holding one hand on her face and smirking. The photobomb happened just moments after the couple tied the knot at Mayfair Library. At the time, Schumer was on her way to meet designer Stella McCartney, but stayed a little longer and allowed the newlyweds to take pics near her private car. Schumer is no stranger to wedding pranks. Back in June 2015, the New York native photobombed an engagement photo shoot for Joseph Turnage and Brandon Moore while jogging in Central Park. 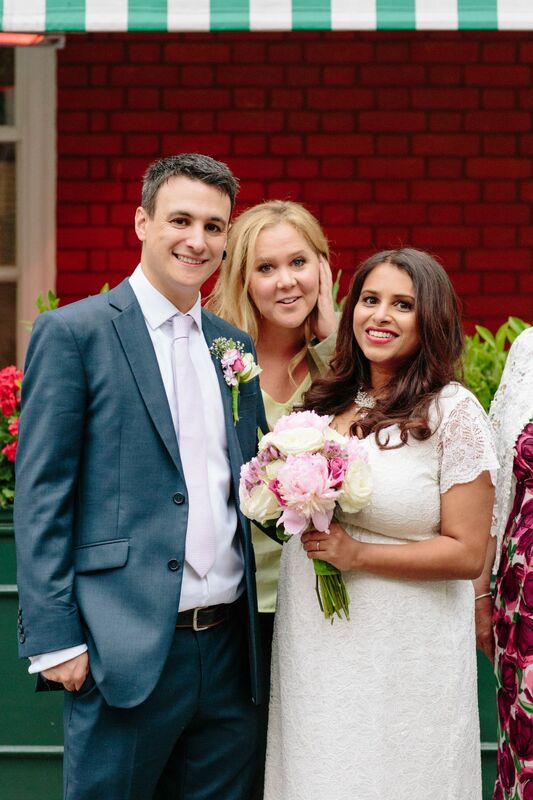 Two months later, she crashed a wedding in Dublin, Ireland, with Judd Apatow when the two were in town to promote Trainwreck. But Schumer isn't the only A-lister with sneaky tricks up her sleeve. The Inside Amy Schumer star was the victim of a photobomb at the 2017 Golden Globes.